British consumers are increasingly moving towards organic food but the industry must work together to capitalise on the full growth potential of organic in the UK, delegates of the UK Organic Congress were told. Co-organised by several leading organic organisations including the Organic Research Centre (ORC), OF&G (Organic Farmers & Growers), the Soil Association and the Organic Trade Board (OTB), the event held in Rugby on 15 and 16 November, conveyed an overriding sense of opportunity, although the development of our future UK agricultural policy was said to be a ‘seminal moment’. Sue Hayman, Shadow Secretary of State for Food, Environment and Rural Affairs, gave the opening address and said the development of the new Agriculture Bill brings great opportunity for organic. “The Agriculture Bill provides a huge opportunity to integrate environmental and food benefits. We know they’re compatible, and we must make sure policy supports this,” said Ms Hayman. She said there are clear benefits to organic methods of farming and questioned why, when organic delivers in so many areas of national policy including food and public health, environmental protection and climate change mitigation, government has failed to recognise the merits of organic, unlike other countries. “The development of a post-Brexit UK agricultural policy is a seminal moment and talking proactively is very important. Sustainability must be at the forefront of a thriving British farming, food and drink sector,” said Ms Hayman. 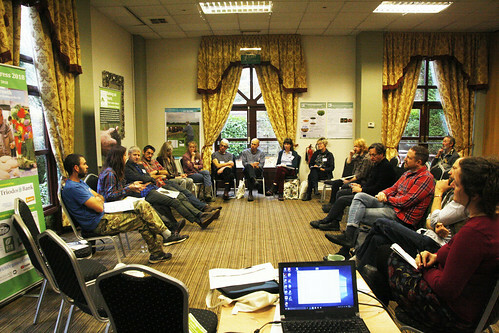 The UK Organic Congress took place in Rugby on 15 and 16 November. The event was organised jointly by Organic Research Centre, Landworkers’ Alliance, Organic Arable, Organic Farmers & Growers, Organic Growers Alliance, Organic Trade Board, Soil Association and Whole Health Agriculture. Further details of the event can be found on the websites of all partners organisations and at https://tinyurl.com/OrganicCongress2018. Detailed proceedings will be available late November here . Photographs from the event can be found at https://flic.kr/s/aHsmtXY2ga, credit to Organic Research Centre.